My passion is organic skin care. I have been formulating products for over 10 years. Each product is handcrafted in small batches here at Surya Spa using only the finest certified organic, biodynamic and natural ingredients. Antioxidant rich plant oils, pure herbal extracts and therapeutic essential oils are blended together to create effective treatments that nourish and protect the skin. * except toners which contain trace amounts of certified organic grain alcohol. 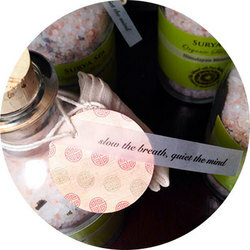 Aromatherapy Soaps, Aromatherapy Soy Candles, and Himalayan Mineral Soaks are also available by special order . 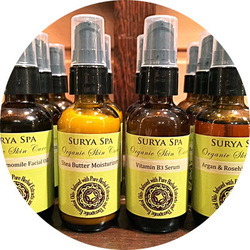 ​All Surya Spa skin care products are available for purchase directly at the studio. To order products for home delivery, please send an email to info@suryaspa.net.